You all know I love a bargain. I shop at TJ Maxx and Marshalls religiously. I don’t buy things that aren’t on sale unless they’re heart palpitation inducing. I don’t think that you have to spend a million bucks in order to have style, that’s one of the main reasons why I participate in the Shop Suey Society. I think they offer great accessories that are on trend and fun but at amazingly good prices – my kind of online shopping. Plus with code Art20 you get an extra 20% off of full priced items! This month all of the Shop Suey Society Members are reviewing accessories priced at $25 and under to really make your wardrobe pop. My pick is the Olivia Scarf for $18! The print is a great boho/tribal print but in shades of blue, which makes it great with neutrals or as a contrasting piece for yellow or orange. It has pom poms. I don’t know why but I think the pom pom fringe around the edge just makes it extra cute. It’s great for Mother Nature’s crazy weather patterns. The weather here has gone from 80 degrees to 50 degrees in the same day. I’ve been carrying light jackets and wearing scarves so not to be cold. It’s an alternative to a statement necklace. I love pairing this scarf with my neutral outfits when I haven’t really thought about how to make an outfit pop – the scarf does all the work for me. It’s great in a rain shower. I got caught in a storm the other day and used this as my impromptu head cover/umbrella – it kept me dry and cute at the same time. My girlfriend’s daughter shares the same name and they’re both cute as can be. What is there not to love about Olivia? What’s your favorite inexpensive accessory? Do tell! 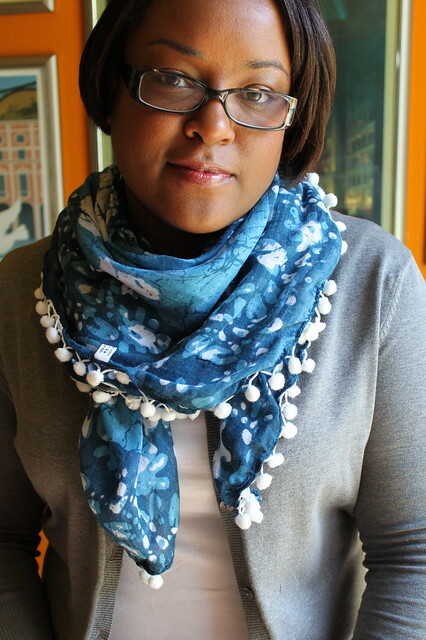 What I’m Wearing: Olivia Scarf, courtesy of Shop Suey Boutique. Use code Art20 to get 20% off your purchase and make sure to follow Shop Suey Boutique on Twitter and Facebook!